So, as officially confirmed, Negredo's time at Valencia has come to an end. The player joins Besiktas, with his arrival celebrated by a truly awful video. The fee is said to be around €2.5 million. So Valencia paid 28m for a player worth less than 20, then sells him for less than a tenth of that and about a third of his value. There are many bad examples of poor transfer dealing in the Lim era, but this one has to be the pits. Negredo joined Valencia back in 2014, sitting out the early months due to an injury. When he did play he was far from the standard that Valencia wanted. He did score some important goals, including a crucial goal to book Valencia's place in the champions league group stage and a goal from the halfway line vs Rayo but all those were overshadowed by him missing sitters, such as the one in the 81st minute vs Real Madrid which would have locked up three points and overall, was nowhere near justifying even half of his fee. Nuno clearly grew to dislike the player and ostracised him and DePaul in his last season. When he did come back, experiments at playing him with Alcacer didn't work and the latter tended to be preferred. Last summer, he was high on Valencia's list of players that they wanted to sell but with no takers, VCF had to settle for a loan to Middlesbrough, with a buy option. With Boro relegated, that buy option wasn't exercised and the club was saddled with him again. 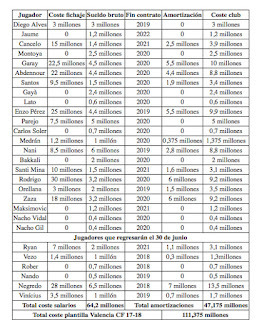 While the transfer fee is pitiful, it does free up a significant financial fair play margin, indeed, at the end of last season, Negredo made up an eighth (!) of the team's FFP budget. With him removed, the club does have space to bring in new signings, which would involve, in order, a central defender then a defensively minded central midfielder. After that, a defender who can be back up on the right and centre would be high and a left winger, with Nani proving injury prone. 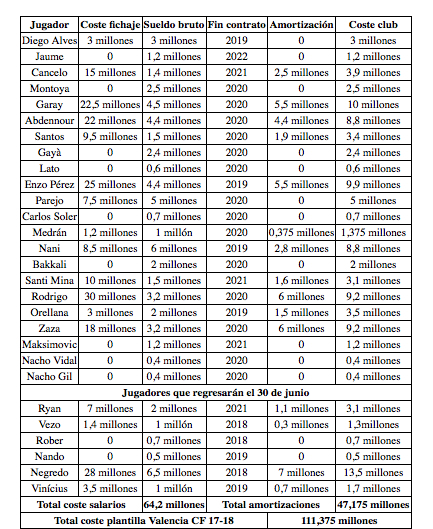 Overall, I wouldn't be too harsh on Alemany and co for the Negredo transfer as it was a mess not of their making. Lim's reckless spending in the first transfer window has really screwed us up and three years later we are still suffering. The club tried last summer to get shot of the dead wood and had no takers and with 85% of the current window gone, it wasn't going to happen this one either. So the administration faced the difficult choice of soldiering into the new season with dead wood like Santos, players who Marcelino doesn't count on or selling them on the cheap to get their salary off the books. Hopefully we can now see some movement on bringing in new signings, with Murillo high on the list. If we can sign a competent central defender and central defensive midfielder, we can yet challenge for top 7.